Here’s something that I feel passionate about. Le Canard Noir is a diving duck and has just come back from a diving holiday. Most divers I meet have developed a special sense of awareness of the fragility of the underwater environment and many of my scuba friends are involved with conservation projects. We see things non-divers do not: damaged reefs, bleached reefs, discarded nets, rubbish, hooks in fish, and disturbingly, we see no sharks. In years of diving the Med, I have never seen a shark. I have seen multitudes of sharks elsewhere, but never in the Med. Shark numbers are in decline. All my diving friends, who have encountered sharks, have similar tales about their first shark dive. They do not report feeling afraid, just awe. Regardless of prior apprehension or fear, every first time shark diver swims towards them, not away. Something strange happens. After that first sharp intake of breath, you quickly want to experience them to the full and fill yourself with this fleeting moment. They are beautiful creatures that make a diving trip in a way that no other creature does. You talk about nothing else in the bar, afterwards. In the diver magazines causes of diver deaths are often reported and I have never seen a death or injury by shark. It just does not happen. Scuba deaths are overwhelmingly caused by ignoring, or diving beyond, your training. Conversely, millions of sharks are killed by humans every year and their long maturation and gestation periods make them particularly vulnerable to over fishing. Unlike bony fish, blue sharks vivipariously give birth to a low number of young and take a long time doing it, and demand for shark products is growing, raising serious questions about their future in the hands of the terrifying marine predator known as the human. 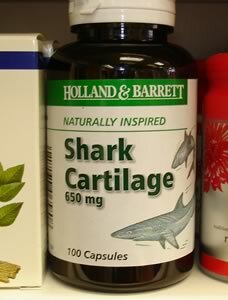 I recently visited a Holland and Barrett and was disgusted to see shark’s cartilage tablets on sale… I later emailed the company, which replied saying that it sold ‘loads’ of the tablet, and apologies for upsetting me. They had not just upset me, they had really angered me! I looked online to see why anyone would buy these tablets. They seam to be aimed at three illnesses – arthritis, cancer and fibromyalgia – bit as far as I can see, it is only the maker that recommends them. We take the threat and welfare to endangered species very seriously and would not be selling any product that contained a by-product of an endangered species of shark. … our product … is a by product of the blue-shark which we are assured is not an endangered species. Holland and Barrett will continue to sell shark cartilage due to popular demand, until such time that the species is classed as endangered. Let’s take that apart. What are Holland and Barrett really saying? Holland and Barrett will of course support banal platitudes about green issues and saving the planet. Our actions are of course different. Someone has told us that fishing for sharks is OK, probably our suppliers. We sell shed loads of these pills and will continue to do so while our clueless customers continue to believe the nonsense on the web about the magical properties of shark cartilage. Sharks never get cancer, don’t you know? We read it on Wikipedia. As Holland and Barret is owned by one of the largest American pharmaceutical companies, we will continue exercise our inalienable rights to make shed loads of money regardless of what you think, and to flog this stuff as long as it is legal, the customers remain gullible, and we can source the raw materials. So, does Holland and Barrett’s defence add up? Do they sell endangered species by-products? The difficulty with sharks is that so little is known about them. 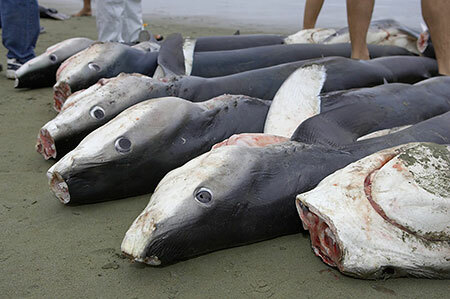 We just do not know enough to fully understand the impact of fishing 10-20 million blue shark individuals. The World Conservation Union, a Swiss-based conservation body, consider the blue shark to be “Near Threatened” and is on their ‘red list‘. So whilst, Holland and Barrett may be technically correct, what are they doing about their trade to ensure that the blue shark retains viable numbers? Uncertainty in understanding how fishing impacts this species should encourage us to be cautious for using this species for trivial uses. And is the use of shark cartilage trivial? Do these supplements do anything? Again, as with most CAM, the stories about shark cartilage appear to be just that – stories. Sharks do get cancer. Gary K. Ostrander et al report in Cancer Research that “justifications for using shark cartilage are illogical extensions of the finding of antiangiogenic and anti-invasive substances in cartilage”. The claims that sharks do not, or rarely, get cancer was originally argued by I. William Lane in a book entitled “Sharks Don’t Get Cancer” in 1992, publicized in “60 Minutes” television segments in 1993, and reargued in another book in 1996. The titles of the books do not match their texts in which the authors note that sharks actually get cancer but claim incorrectly that sharks rarely get cancer. We make three main points below: (a) sharks do get cancer; (b) the rate of shark cancer is not known from present data; and (c) even if the incidence of shark cancer were low, cancer incidence is irrelevant to the use of crude [shark] extracts for cancer treatment. As for other claims of healing benefits from shark cartilage, it is worth noting that there are other, far cheaper and more environmentally friendly sources of cartilage that could be used. Pig’s ears spring to mind. I speculate that this might be somewhat harder to market in your local high street, even if it were effective – which it isn’t. Holland and Barrett fail to give references for their ‘clinical evidence’. There is no good evidence – at best, just some speculative test tube experiments. It is difficult to think of another shop on the high street where the vast majority of their products do absolutely nothing and are based on nothing but delusions. Holland and Barrett are leaches on our culture of distrust in science and medicine and prey on people who ‘like to to take control of their health’. This story exposes the myths of alternative health care being green and caring, about small alternative health businesses versus ‘Big Pharma’, and enabling people to manage their own illnesses. Shark cartilage is sold by a billion dollar US based pharmaceutical company, NBTY (owners of Holland and Barrett and GNC), with no good evidence of effectiveness and who in doing so, threaten vulnerable species. On top of this, the Food Standards Agency have issued warnings about US imported shark cartilage pills being a source of salmonella. NBTY issued a recall on their shark products earlier in the year. Some conservation organisations are on the case. Bite-Back, a shark and marine conservation body, have a ready made web form for you to sign and send to Holland and Barrett expressing your concern. Why not give it a go? good work le canard noir. it is sickening to see the lengths to which money-driven woo-mongers will go to derive new products with fantastical claims of efficacy, no matter what the cost to the environment or the gullible people who take the products. seems the basis for using any form of cartilage is tenuous at best, and even then that is hardly justification for a cull of sharks. do you plan to take H & B up on this issue? naming them is step one, shaming them would be good!! I signed the petition and got an email from Holland and Barrett which was clearly a cut and paste job of the letter to Diver magazine. I replied and directed them here. What is interesting is that H&B say that there is no or only contradictory evidence for the use of shark cartilage. This sounds as if they are willing to use blue sharks for a useless product until by their own actions they have become endangered. Great stuff, but Andrew Wakefield did not claim that the MMR vaccine causes autism. and this one guy caught a 844 pound shark near florida….that is just wild!!! I think your all getting your knickers in a twist the shark cartilage is actually from catfish which are already killed for other uses anyway….i hope you are all vegans and dont wear leather etc etc otherwise that would just be hypocritical now wouldn’t it? What just because i have a different opinion its propaganda? The most effective propaganda is often completely truthful. why will my comment be deleted? If so that is dictatorship you are obviously very narrow minded and do not accept other peoples opinions, however i would be pleased for you to prove otherwise that holland and barrett are actually shark killers. Holland and Barrett help thousands of people through their extensive training on various ailments when they have given up on hospitals and doctors and turn to a herbal approach on debilitating ailments and problems and have a better like because of them they are caertainly not quacks. Why would I delete such a comment? Because it is just ignorant blithering. First, catfish are Osteichthyes (bony fish) unlike sharks which are Chondrichthyes (cartilaginous fishes). Catfish skeletons are made from bones, and sharks skeletons are made from cartilage. Hence, your statement must be crap. If H$B really are using some catfish derived products then we ought to get onto trading standards pronto. But, fortunately for them, it is not true. The hypocritical vegans comment is equally as daft. It is possible to be a meat eater and be concerned that vulnerable species are being exploited and put at risk by commercial and unethical interests. Holland and Barrett themselves say that their pills contain “shark cartilage powder”. Are you calling them liars? Holland and Barrett are part of the vast $56 billion international food supplement industry that prey of peoples’ desires to find simple solutions to life’s problems in little tablets. Owned by NBTY, a huge Aemrican pharamceutical company that makes about $2Billion per year, H$B is there just to take your money off you as quickly as possible. Believe what you wish! Your motivation for posting such toss is the most interesting thing about what you say. Would you care to say who you are and what your motivations or will you hide behind the cloak of ‘Anonymous’? I found out today that Holland and Barrets are infact owned by Mc Donalds!! So what i have read here does upset and anger me but does not suprise me!! I also would like to note that a large handful of holland and barret products contain palm oil…..so I can assume that their concern for environmantal and endangered species does not run that far!!! It’s all just token gestures!! by the way, that previous comment was from a different ‘anonymous’ not the other blithering ‘anonymous’. I am karen and not blithering at all!! The above pictures arnt anything to do with holland and barrett, it is just a picture placed on the internet. Holland and Barrett are part of a society which helps to protect the unfair treatment of animals to aid the production of pharmacuticals. Im sure that everyone on this web page has allowed a piece of meat to pass there lips and not even given one thought about how the animal was treated or slaughtered, so for gods sake think about how it benefits people, the sharks cartalige product enables many people to live a higher quality and standard of life, so put it into concept and try moaning about something worthwile, like I dont no, war? Well done whoever produced this, on a whole waste of time…. Chloe said "Holland and Barrett are part of a society which helps to protect the unfair treatment of animals"
and wouldn't they just love you to believe that. I do hear though that H&B and have stopped selling this product now. and nahh, they havnt stoped selling it, maybe the day you checked they were all sold out because of the high need for it? why don’t you attack the so-called “conventional medicine” manufacturers? They are the ones who are money-driven. People like you annoy me. Dear Anonymous – that is a staggeringly naive comment. Holland and Barrett is owned by one of the US largest pharmaceutical companies, BNTY. In 2003 they had a turnover of $1.6 Billion with profit of $131 million. They have just acquired Julian Graves on the UK high street as they want to dominate and monopolise the whole so called ‘health’ food sector. 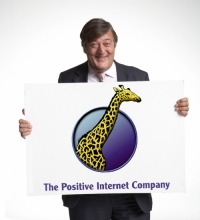 The takeover is subject to an investigation by the Office of Fair Trading. Do you seriously think these ys are not interested in fleecing as much money from you as possible? Thank you for highlighting this issue. I have noticed for some time now that the marketing of these kind of products seems to be increasing, it seems that the world is going backwards with regard to human abuse of other species. I always think there is another way you can help yourself that does not involve harm to others. Thank you for highlighting this issue. I am worried and disgusted at the way the world seems to be going backwards with regard to the abuse of other species. The description of humans as a terrible marine predator is highly accurate. I also think there are always other things you can do for your health that do not involve harm to any other. I know of an established well-respected research worker who has dissected 2000 sharks and never found cancer in a shark. Enough said. There's 'shed loads' of this stuff for sale on the internet. Why just target one high street retailer? This looks more like an anti-H&B campaign, rather than what it should be, an anti-shark cartilage campaign. Get your act better organised CN. Otherwise you just look like a ranter, and will do the real campaign a lot of harm. Oh come on. H&B are a 'respected' high street retailer. One might think the fact they sell products means they must be something in the claims made about the products. But H&B are far to clever to make the claims themselves – they just provide 'food supplements' and let the interweb make their claims for them. My wife takes sharks cartilage for her knee and it has improved it no end, she ran out of the tablets and within 3 weeks was having problems again yet when she bought more it improved. I do not believe in unnecessary death however do you want to start feeling sorry for all the fish sharks eat all the rabbits foxes eat, personally the biggest problem with that picture for me is the waist of food it represents.